While many backpackers just throw their gear into their packs with no organization the day before their trip, there is a method in packing it properly to improve their overall backpacking experience. Learning to organize your gear properly before loading your backpack will eliminate forgotten items and help you remove unnecessary luxuries. In addition, efficiently packing your backpack will give you more comfort, convenience and stability. Before loading the pack with your backpacking gear, be sure that you have the proper pack size to fit the gear you plan to bring. In short, you want to find the line between eliminated unnecessary weight and certain luxuries for comfort. Upgrading to new and lighter equipment will help keep weight and pack size down. Also, keep in mind that shorter trips will require you to pack less gear while more gear, such as clothes and food, are needed for longer trips. For more detailed information on choosing a backpacking backpack and finding the right pack size for you, visit our Backpack Buying Guide. By distributing weight in a specific manner, you can achieve better comfort, convenience and stability. Instead of simply stuffing your backpacking gear inside your bag, follow these guidelines. Internal backpacks have recently become the standard backpacking frame type. While trail hiking with an internal-frame pack, items with the most weight wants to be centered high between the shoulder blades and close to your back. By doing this, the weight is placed on the hips which should hold most of our backpacking pack’s weight. When off the trail, items should be placed a bit lower on the back, lowering your center of gravity and stabilizing you better on rough terrain. External backpacks are still used, although less common than internal frames. They are recommended for trail hiking only. The heaviest items should be packed on top and closes to the back to center the pack’s weight over the hips and help you stay in a more upright stance. Either frame type you choose, medium weight gear (water filter, first-aid kit, stove) should be placed in the middle and furthest from the back. Lightweight items (sleeping bag, clothing, odds and ends) should be placed lowest in the backpack. To learn more about the different frame types, see the Backpack Buying Guide. Be careful to not overload your pack or body. A loaded backpack shouldn’t exceed 25% – 30% of your ideal body weight. Although this is a general guideline, some experienced backpackers may be able to carry more weight. Beginner backpackers and less-fit persons should start with less weight. In order to pack your backpack correctly, you may want to lay out all of your backpacking equipment to get it organized. This is a great way to make sure you have all your gear and organize it by weight. Another good idea is to cluster similar small items, such as eating utensils and pots, together in zip lock or stuff bags. You may want to even go further and color-code them as well. It is also a good idea to store food and liquid fuel in bags to prevent spills. When loading your pack, be sure to follow the weight distribution guidelines given above. As lightweight items should be stuffed at the bottom of the backpack first, the sleeping bag usually goes in first along with other light nighttime supplies. After, pack medium-weight items, followed by heavy gear. When packing your backpack, be sure to fill in all empty space with small or compressible items. For example, you can stuff a shirt inside a pot, put a roll of duct tape around your hiking poles, or remove your sleeping bag from its sack and stuff it around other gear. If you are using a bear canister, as more and more national parks and wilderness areas are requiring, be sure to fill it completely full with food and other scented items (be sure to pack this closest to your back). Certain items like a GPS, insect repellent, snack food, rainwear, or a headlamp may need to be accessed at any time. Because of this, these essential things should be stored inside a front pocket, top lid, or in the top of the main compartment so they can be found with minimum searching. After your bag is loaded and packed, tighten all compression straps to limit load-shifting while hiking. 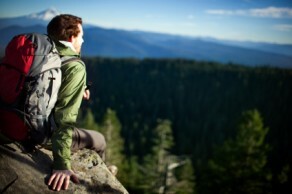 To learn more, visit Wild Backpacker’s Sizing & Fitting a Backpack article. If you have packed your backpack properly and have the right pack size, you shouldn’t need to attach much ot the outside. However, sometimes it is necessary due to limited space or odd shaped items. Try to avoid doing this, however, because lashing gear to your pack could affect your balance and may also swing, rattle, or snag plants on the trail. To avoid stability issues, be sure to balance weight of items attached to your bag. Trekking poles can be vertically attached on the outside of your backpack on either or both sides beneath compression straps and tucked inside the water bottle pockets on the bottom of pack if available. You may also choose to strap your tent poles to the outside as well. Bulky items such as a tent, sleeping pad, or sleeping bag (although many packs come with a special sleeping bag compartment) could be attached on the top or bottom of the pack horizontally. Just remember, if you plan to do on-trail hiking, keep items with the most weight higher. Some backpacks have straps near the top lid or underneath. You may want to store air-filled pads or sleeping bags inside a bag to avoid possible punctures. If you backpack as a daisy chain on the front, you may also utilize this to hang gear from. Although it is intended for mountaineering equipment, you can improvise with rope or carabineers to hang items.